Brainstorming can help you develop an idea for a topic or thesis and identify questions and keywords. Brainstorming, mindmaps and concepts maps are terms that are often used interchangeably. They all refer to a quick, simple technique for generating and focusing ideas and making connections between concepts. When brainstorming, don't worry about grammar, spelling, or formatting initially. Just jot down ideas until you can't think of anymore, then go back and make connections between the ideas. If an idea appeals to you, make it the center idea on a new piece of paper and brainstorm more details. Here's an example of a mindmap. The student used colors to organize her ideas: red is the idea she started with, green are broader concepts, black are subtopics. She put a red star on the topic she decided to focus on. 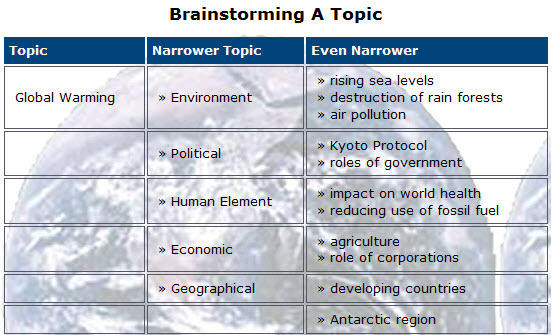 This shows a more formal example of brainstorming to go from a broad topic (global warming) to more narrower topics (like environment and political), to even more narrow topics (like rising sea levels and roles of government). Then simply write all the ideas and concepts you can think of related to the central idea.